The beverage sector is experiencing an explosion of choice, innovation and passion. Suddenly everyone has an opinion - whether it’s the merits of Marlborough hops over Canterbury wheat or if rum is the new vodka. With so much interest, it’s time for the experts to inform the curious-minded and encourage experimentation. Consumers are saying, ‘let’s try something new’. 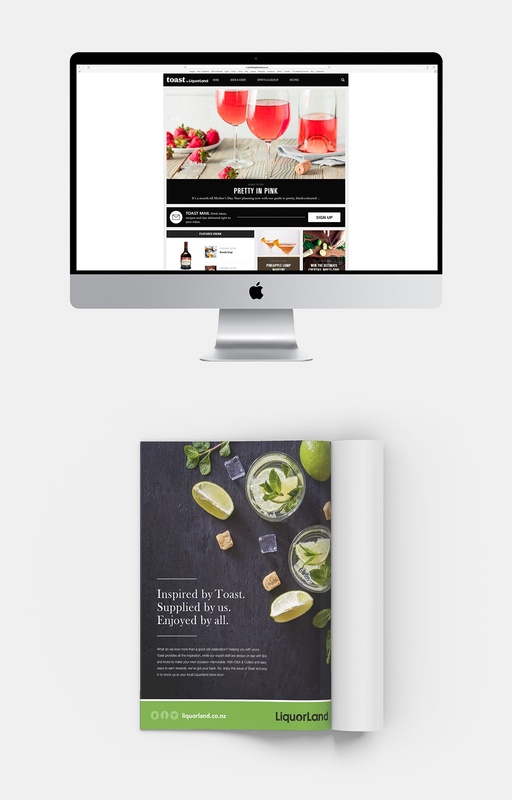 After pouring over some ideas and refilling several ice cube trays, we created Toast magazine – Liquorland’s inspirational guide to wine, spirits and craft beers, packed with helpful ideas about discovering new brands, hosting occasions and enjoying a richer beverage experience. From a design perspective, we aimed for a look that was something people would be proud of to have on their coffee table. Therefore a strong emphasis was placed on the overall design system, elements and art direction. It’s a glossy 84-page magazine distributed to 100,000 Kiwis via premium New Zealand magazines twice a year and as an in-store reward for Liquorland customers. Toast positions Liquorland as knowledge leaders, while driving retail sales and supporting brand positioning. But it’s also much more than just a magazine, with support from an equally inspiring website, eDMs, videos, social media and in-store POS .